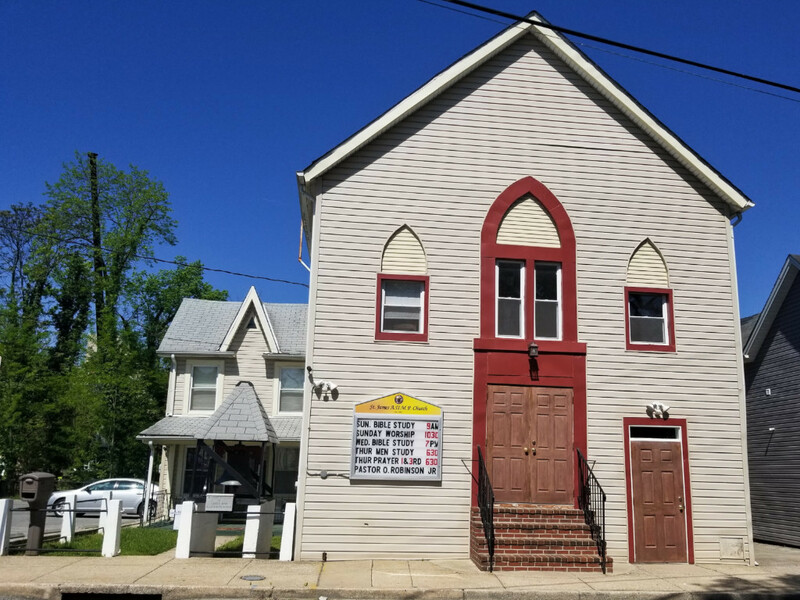 The origins of this two-story frame church on Jefferson Avenue began in 1861 when a group of Black Baltimore County residents established the Saint James African Union First Colored Methodist Protestant Church. Today, the church is known as the St. James African Union Methodist Protestant Church and the building has stood on this site for over a century. Saint James is the second-oldest church operating in Towson and the oldest of the area’s Black congregations. The original church members lived in East Towson—a small settlement founded by Black men and women who were held in slavery on Hampton estate before their emancipation in Maryland in 1864. Before the community had a dedicated church for worship, they held services in the homes of congregation members James Garrett and Frank and Ida Scovens. On October 17, 1881, the church building opened and for twenty-five years members gathered for regular worship in a modest one-story building. In 1906, a growing membership led to the addition of a second story to the building. Immediately to the right of the church building sits a 173-year-old church bell—a relic from a church originally located in Govans. Today, Govans is a neighborhood in north Baltimore City that initially developed as a crossroads on the York-town Turnpike (built in 1810 to connect Baltimore to York, Pennsylvania). Cast in 1845, the bell was donated to the Govans church in 1875. For some period, the bell was used not only to remind worshipers of services but also to notify residents about the departure of the trolley cars on York Road. For the members of St. James Church, the bell is an iconic symbol of the church’s long history of 10:00 am services—led for over two decades by Reverend Joseph McManus. Rev. McManus presided over the church from 1961 to 1983. Every Sunday morning, he rang the bell twelve times in reference to the twelve tribes of Israel. The church was temporarily renamed the St. James Methodist Community Church in the 1980s, but the church has since reverted to being called St. James A.U.M.P. Church. The building and congregation still holds services today under current Pastor Osborne Robinson, Jr.
Gabrielle Clark, “Saint James A.U.M.P. Church,” Explore Baltimore Heritage, accessed April 23, 2019, https://explore.baltimoreheritage.org/items/show/648. Diggs, Louis S. Since the Beginning: African American Communities in Towson. Uptown Press, Inc., 2000. E.H.T. Traceries. “St. James African Union First Colored Methodist Protestant Church (BA-1000).” Maryland Inventory of Historic Properties Form. Crownsville, MD: Maryland Historical Trust, November 5, 2001. Published on Jun 11, 2018. Last updated on Nov 27, 2018.